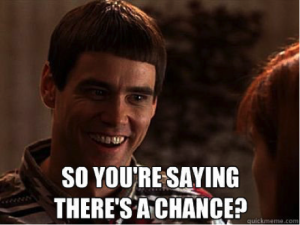 So you are saying there’s a chance? I have a business trip I leave for on Sunday to Vancouver where I’ll be gone all week. Really hoping I have a chance to get on a sailboat for a couple hours. Finding one that does that with a captain seems to be a bit of a challenge, but I’m not giving up yet. Google don’t fail me now! We are also continuing to work on our passive income strategy. Meeting with a friend who runs a business investing in distressed property for long term investments. That will be after I get back from Vancouver. …still totally obsessed with ZTC. Started from the beginning and now I’m reading through 2011. Four more years to catch up.